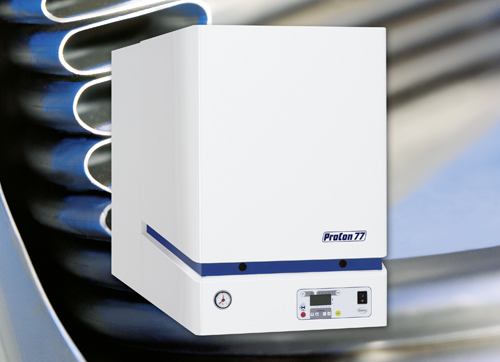 ProCon 77 gas condensing wall mounted commercial boilers have been specifically designed as a direct, energy efficient replacement for MicroMat (Strata in the UK) boilers. They offer exceptionally high energy efficiency with the potential to reduce heating costs by as much as 40%, while also reducing carbon emissions and environmental impact. Wall-mounted gas condensing boilers in the output range from 15 to 75 kW. Specially designed as a direct replacement for the MicroMat 45, 60 & 75 range (Branded as Strata within the UK). Direct alignment of hydraulic, gas and condensate connections. A flue adapter is available to reconnect on to the existing flue. Extremely high energy efficiency with fuel engineering related efficiency of up to 109.5%. Up to 40 % heating cost savings as a result of particularly low fuel consumption with an extremely high standard performance level. From a detached houses and apartment blocks, to commercial properties – the wide range of wall-mounted ProCon gas condensing boilers with their various equipment packages leaves nothing to be desired. The space-saving ProCon devices can be installed practically anywhere in the house – this is made possible by their attractive design and in particular by their low-noise operation. Cascade controls available for up to 16 ProCons and limitless heating zones. ProCon 77 – Micromat Wiring, PDF Download.